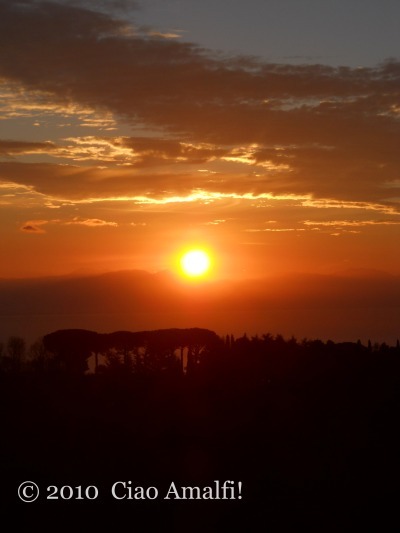 With a boyfriend who works as an official tour guide for the region of Campania, our days often start early. Especially when his groups depart from Sorrento or Salerno over an hour away. The bright side is that I get the chance to watch the day begin, as the sun climbs up over the mountains across the Bay of Salerno. Yesterday morning, while I was still puttering around the kitchen making a cup of tea, I noticed the bedroom was lit with a bright orange glow that I hadn’t ever seen before. I grabbed my camera and opened the window to find this glorious sight. The vivid orange and the trees silhouetted by the intense darkness reminded me of images I’ve seen of sunrises on the Serengeti. A deep breath of cool, clear air. What a way to start the day … And the New Year! Buon Anno & Happy New Year wishes to you!! This year was a rainy Christmas on the Amalfi Coast, but a few wet days are nothing compared to the snowstorms and cold weather that have hit northern Europe. The news has been full of stories of flights cancelled and even the Eiffel Tower in Paris closed because of the heavy snow. I feel sorry for the many families that were not able to be together for the holidays this year because of the bad weather. As I see the snowy pictures from Paris, however, I’m reminded of a very special travel memory from when I visited Paris last January with my boyfriend. It was my first time in Paris, and our first time traveling together. Our sweet studio apartment that we called home for a week was just a couple of blocks from the Champ de Mars park and the Eiffel Tower. It was a dream! We arrived after dark and immediately went out for a walk around the neighborhood. It was a quiet January night, and it seemed like we were alone in the Champ de Mars park under the warm golden glow of the Eiffel Tower. The first delicate flakes of snow were starting to fall. Magical doesn’t even begin to describe what it felt like to see the Eiffel Tower surrounded by snowflakes glistening in the cold night air! 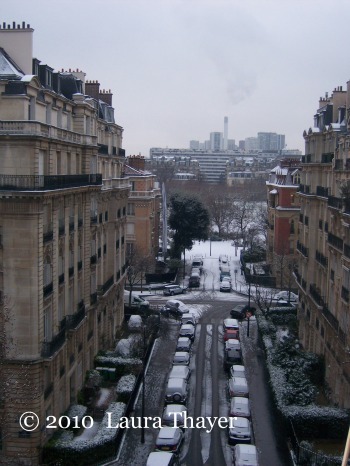 The next morning we woke to find Paris covered with a light dusting of snow. 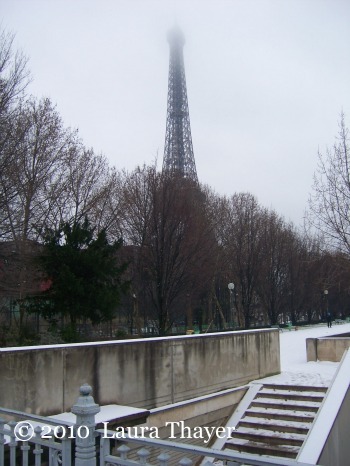 Wrapping a warm scarf around my neck, I hurried to the windows and threw them open to see the view – the Eiffel Tower against the somber grey sky and the Champ de Mars garden completely white. Down below in the street parents were hurrying their children, bundled up from heat to toe, into the school nearby. It wasn’t long before we were out exploring the white city. 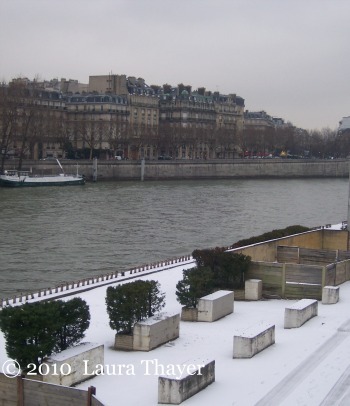 The crisp, cool air felt so good as we walked along the Seine, listening to the crunch of the snow under our steps. We made our way toward the Musée d’Orsay and spent the morning exploring the museum. I couldn’t help but smile when I saw Gustave Caillebotte’s Vue de toits (Effet de neige), an impressionistic rendering of the rooftops of Paris covered in snow. It looked wonderfully familiar! That afternoon, as the snow melted away, we walked along the Boulevard St-Germain. We stopped at a quaint café looking out toward the Paris’ oldest church, St-Germain-des-Prés. Sitting there, sipping vin chaud with the person I love and watching the hustle and bustle on the white sidewalks, I realized that the dusting of snow had made our first day in Paris even more romantic than I could have possibly imagined. Head over to this post to see the rest of my photos from Paris last January. Buon Natale from the Amalfi Coast! This week instead of Photo Friday, a little music seemed like a fun way to celebrate this Christmas Eve day. Here’s one of my favorites by Nat King Cole to get you in the (Italian) Christmas spirit! Buon Natale means Merry Christmas to you. Happy New Year and lots of fun. Buon Natale, may all your wishes come true. This weekend the town of Scala on the Amalfi Coast will be featured on the weekly TV show Borghi d’Italia on TV2000. Each week Borghi d’Italia features a small town in Italy focusing on art, history and traditions. 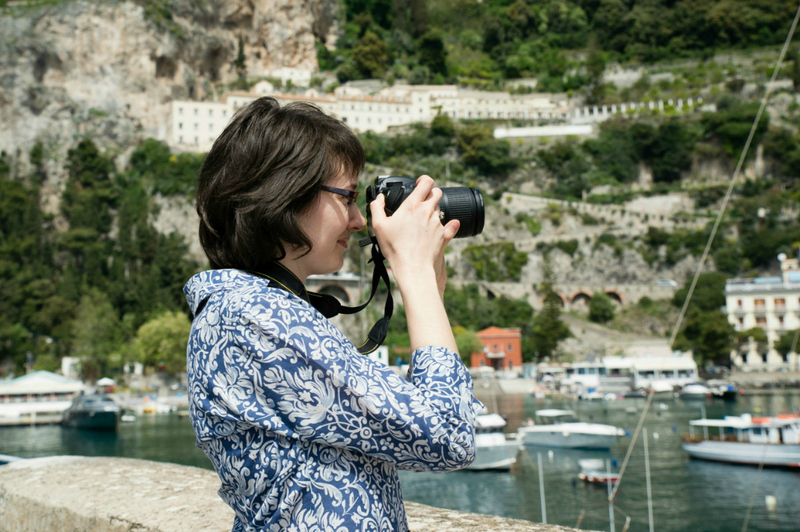 For anyone who loves the Amalfi Coast, you won’t want to miss this look at one of the oldest towns on the Costiera Amalfitana – Scala. If you’re in Italy, tune into TV200o (channel 801 if you have SKY), or visit the TV2000 website to watch the show on the wonderful live streaming video on their homepage. 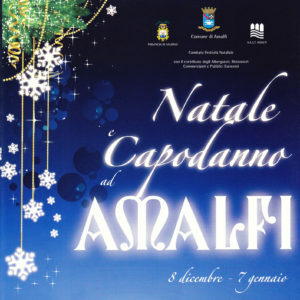 Christmas & New Year’s Events in Amalfi! Head over to the Amalfi Coast Local Flavor Blog on NileGuide to find out about all of the fun events scheduled for Christmas, New Year’s and Epiphany in Amalfi. I’m looking forward to sharing stories, photos and videos of the holiday events this year!